(Disclaimer: Admittedly I’ve only just started pouring over Louisa’s works, and I haven’t yet ventured into her “blood and thunder” tales, so my comments here are limited to the later stage of her writing which proved to be the most successful). 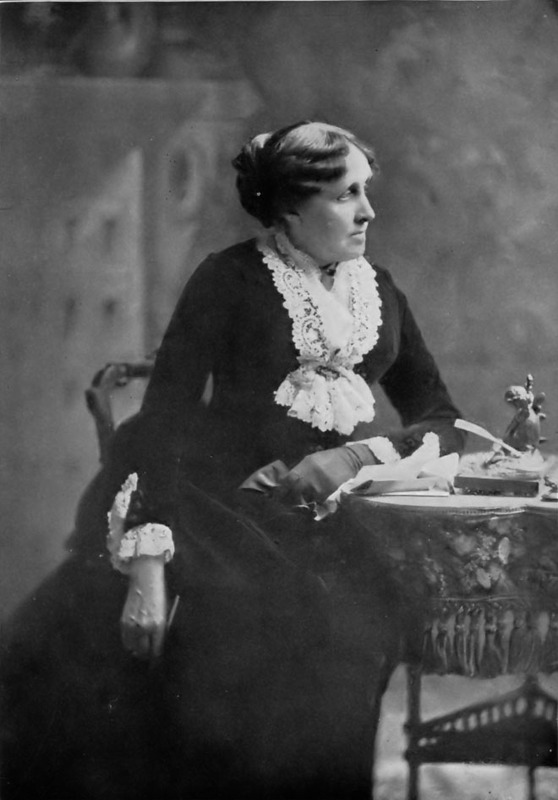 I’ve often said that Louisa May Alcott’s genius was twofold. She crafted stories of realism, sometimes poignant, often humorous, always entertaining. They were filled with very human characters who seemed as familiar as our neighbors. And ever pragmatic, she also was willing to learn and adapt herself to new genres, mastering several. 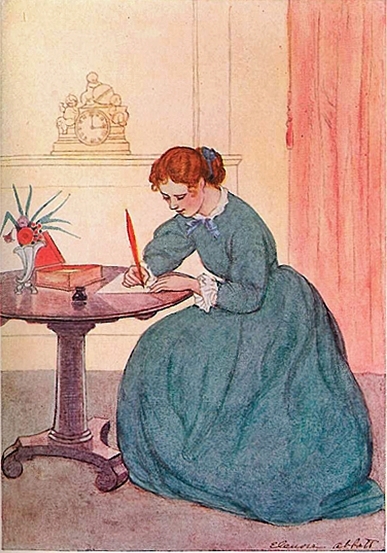 Louisa may have lamented the fact that she wasn’t recognized in her time as a “serious” writer but she was a voice of her era with a modern twist, thus making it a voice that resonates today. In the words of the late Madeleine Stern, considered the preeminent Alcott scholar, Louisa was the consummate professional. It’s ironic considering that Louisa had no formal training and did not go to public school or university. She was never mentored by a more experienced writer but instead was totally self-taught. There were precious few role models. In a time when there were virtually no women “professionals,” Louisa learned how to be one. She was a pioneer, and that to me is genius. Now I’m beginning to believe there is another layer to this genius. Louisa had a rare ability to take controversial ideas and wrap them up sweetly in children’s stories. It’s rather like the pill you have to feed to your dog – you wrap it up in something he loves like a piece of cheese, and he downs the pill without incident (unless your dog is too smart for his own good!). He doesn’t even realize he’s downed the dreaded pill and his ailment is taken care of. In the same way, Louisa “wrapped” issues concerning the autonomy of women, the state of the family, and the care of children in sentimental tales like An Old-Fashioned Girl. 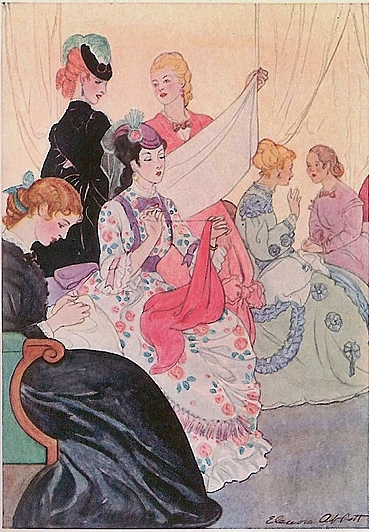 Charles Strickland’s book, Victorian Domesticity: Families in the Life and Art of Louisa May Alcott, points out many of the ways Louisa inserted these topics into this story. Polly was a woman with purpose. Polly then proceeds to show Fanny what she means through the lives of her working friends (Miss Mills (the landlady), Becky (an artist), Bess, Rebecca, Kate (an author)). Fanny not only experiences their happiness through sense of purpose, but she notes the authenticity of their friendships which were based on the real rather than the perceived. Chapter 15 suggests that Polly was tempted, for a moment, into a life of fashion when (Arthur) Sydney (aka “Syd”) showed an interest in her. Syd was the apple of Fanny’s eye but he was attracted to Polly. Although an upright and fine young man, perfect for marriage, Polly turned him away because she knew she didn’t love him and feared tiring of him. Syd was well-off and would have presented Polly with a life of ease and security (i.e. beginning her own family of fashion), but she resisted the temptation, remaining true to herself. She retained her autonomy. The Shaws were a family of fashion. Polly had experienced the family of fashion in the Shaws and found that life empty and wanting with its endless parties, love of money, concern over appearance and distinction of classes. It was an shallow life that robbed the Shaws of meaningful relationships with each other and those outside their family. I had noticed too how Fanny had begun to develop these “aliments” and I could see why so many women became invalids during the Victorian era. One cannot deny their authentic self forever and not feel the affects; the body has a way of acting out what the mind and heart will not admit. Thoreau certainly understood that. I had read most of An Old-Fashioned Girl before I came upon Strickland’s book and was pleased to see so many of my thoughts verified. He analyzes other Alcott books such as Work, Moods, Eight Cousins, Rose in Bloom and Jack and Jill. I had had my doubts as to whether I would find any meat in Louisa’s juvenile works. Obviously I have a lot to learn! And a lot more reading yet to do. Eight Cousins is full of this stuff. She wears warm clothes instead of the fancy dresses with the plunging necks for winter. She doesnt drink coffee and she runs around like a boy. I think there was a disclaimer about the wild ideas Uncle Alec had in Rose in Bloom too? Oh, its been so long, maybe it was in the first book. Interesting, wearing warm clothes instead of plunging necklines – sounds just like today. Not that I have the figure anymore for the styles younger girls wear, but I always dressed for comfort rather than style. I don’t know how girls today can wear what they wear in the dead of winter! I have a vintage 1945 edition of Rose in Bloom and am searching now for a vintage copy of Eight Cousins. I finding it really cool to read the vintage books. 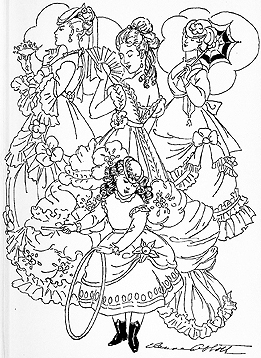 Sometimes you get great illustrations, like the 1920s version of Old Fashioned Girl that I have. Louisa had a rare ability to take controversial ideas and wrap them up sweetly in children’s stories. This is a REALLY interesting point. I’ve only read <i.Little Women and Hospital Sketches so far, but I’ll be looking for controversy wrapped in sweetness, in my future visits with her stories. 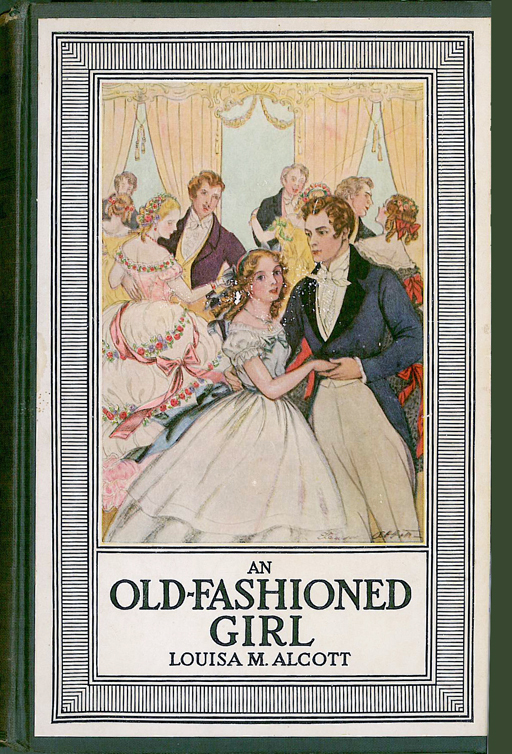 I had thought about how many grown-up and modern ideas were in Old-Fashioned Girl and was really pleased to see my thought backed up in Strickland’s book. His book was a godsend, really gave perspective on the times and filled in a lot of cracks. I just finished and Old Fashioned Girl and was quite blown away by the Sunny Side chapter and the sisterhood. So I came to your site for further reading. What did you think of the Bess and Becky relationship? Two soul mates who would not be parted even by the marriage of one of them. Very poignant looking at it with our 21st century insights. I had to go back and reread that chapter. 🙂 That was my favorite chapter (that’s what prompted that post). Louisa so easily wove in such modern themes for women with the dual purpose being leading purposeful lives and supporting each other. I have a cousin who has had a lifelong woman companion – it’s very much like Bess and Becky. They are inseparable and so good for each other. We treat her friend as a member of the family. They were both educators, now retired, terrific women.